Quail are becoming more popular to keep for their delicious eggs but if you would like to increase your stock levels or sell hatching eggs, there are a few tricks to ensure you are getting good levels of fertility. The optimum temperature to keep a breeding pen is around 21°C. Males tend to lose interest in the females once the temperature drops below 16°C and during spells of very hot weather. Breeding stock can be kept in trios or even quartets but for the optimum fertility, you can have a pen containing more than one male but the more males there are in a pen, the more fighting there will be amongst them, so care should be taken. If fighting is a problem, sometimes adding more females will help. A mixed pen can usually contain up to 5 females per male without fertility being reduced significantly. Females can lose feathers on the back of the next where the male grips with his beak during mating. Female Coturnix quail (also known as Japanese quail) take 8-12 weeks to mature before they come into lay and just like other poultry, the pituitary gland at the back of the eye is stimulated by light to produce a hormone which keeps them laying. This means they will usually start laying during spring and stop in the autumn. If you want more eggs, they can be encouraged to lay around 220 per year if kept under artificial light without performing any special selection, although not all of these eggs are useful for hatching. Males excrete ‘foam balls’ which allows you to positively identify them. These are a urinary product produced by cloacal glands and indicate fertility. If you are unsure if a quail is male or female, you can partition the house and place the bird in question in the new area on his or her own on a clean floor which can be examined regularly during the breeding season for the presence of foam balls. Once positively identified, a coloured leg ring can be used to identify him. Quail fertility is reduced after the first 16-18 weeks of lay and after 24 weeks, the reduction in fertility is very noticeable. It is therefore best to collect hatching eggs only during the first 14-16 weeks of lay. If a continuous supply of hatching eggs is required, multiple houses and lighting regimes would be required so that birds were coming into lay as the fertility of another house was in decline. Fertility and hatchability both decline in older birds so after their first year or two, for optimum fertility, it is necessary to retire or replace breeding stock. Most incubators will take quail eggs although you may need to purchase an additional tray if it doesn’t come as standard. 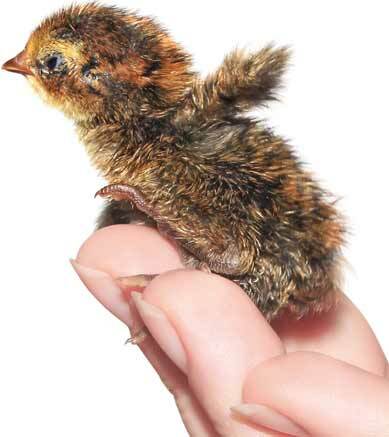 Coternix quail rarely go broody and their eggs are difficult to hatch under a broody hen due to their small size, so you will probably end up having to incubate eggs artificially. If you do want to try to encourage them to nest and sit on their own eggs, provide them with sheltered places and lots of natural cover in their run or aviary, together with nesting material like chopped straw. All species require a temperature of 37.5°C at the centre of the egg, decreasing slightly to 37°C once they start to hatch (pip the shell) on the final days. The optimum humidity during the incubating period is 45%, increasing to 80% during the hatch. Due to their mottled shells, quail eggs are difficult to candle so most people will just run the incubator until hatch time is reached without candling. When the young hatch, they are tiny and very sweet. As with other poultry, they will need artificial heating from a heat lamp or other hover heater which should slowly be raised as they grow. Beware: they are small enough to fit through normal chicken wire and are adept to escaping! Young quail require a high protein starter crumb, such as Turkey Starter Crumbs and as with all poultry require fresh water at all times. This should be provided in a narrow lipped drinker that they can’t climb into. If they get wet, even with a heat lamp, they can soon get cold and die. Hopefully this gives you some help with breeding Quail!